Turning the traditional cinema format on its head has created a new experience for movie-goers, and a higher return for the client. Hoyts Cinemas is an integral part of Te Awa shopping mall at The Base retail precinct in Hamilton. Designed to act as a meeting and event space, as well as a cinema, the space is a new take on ‘going to the movies’ and has created a multi-use venue that enables Hoyts to offer a range of experiences. Occupying 6,000sqm within Te Awa shopping centre, the state-of-the-art venue features six 3D-capable screens and more than 1,400 seats. In addition to its cinema facilities, the complex includes an auditorium for big-screen events, conferences, 3D concerts and sporting events, along with private lounges and in-theatre dining. To ensure ‘a great night out’, Hoyts Te Awa also offers a new experience for movie-goers – a walk-through food emporium, which incorporates an ice-cream parlour, wine cellar, delicatessen, lolly dispensary and gourmet hot dog stand. Hoyts Te Awa is New Zealand’s first fully digital cinema complex, and features the latest Dolby 7.1 surround sound. It is also the first cinema in Australasia to offer immersive ‘D-Box’ motion technology, which completely transforms the movie experience with theatre seats that pitch, roll and heave in sync with the onscreen action. The design strategy for this project was to create a completely new experience for cinema-goers. Hoyts was eager to evoke the feeling of an industrial space, and this was achieved by exposing structural elements and installing shuttered concrete finishes within the eight metre high box office area. By removing the food offering from the box office zone, the design created an inviting, standalone food emporium. The addition of an entry-level bar and meeting lounge, with an interactive video wall, adjacent to the ticket area provided another point of interest for movie patrons. Large glass panels, secured with spider fittings and with a white dot system applied, mean images can be projected behind the box office counter. The transparency of the glass allows these images to bleed onto the staircase behind. Strategic use of LED lighting throughout the complex provides flexibility of colour and an added stimulus. Custom-designed and manufactured Axminster carpet provided a unique finish to the floor through the runways and in the cinemas themselves. 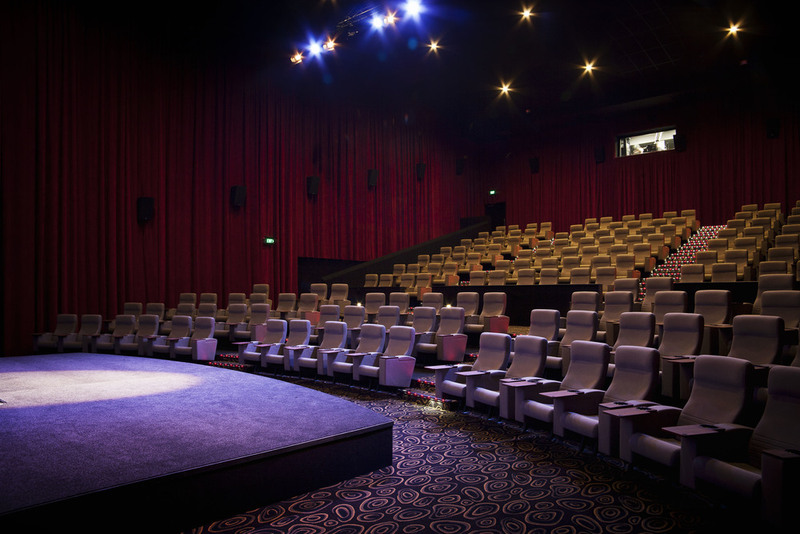 This innovative environment set a new benchmark for the cinema experience in New Zealand and is already delivering returns well above those of traditional entertainment complexes. From a commercial perspective, moving the food offering away from the box office to a sizable area of its own has been particularly successful, resulting in a substantial increase in sales.